What exactly is organic latex, and how is it made? 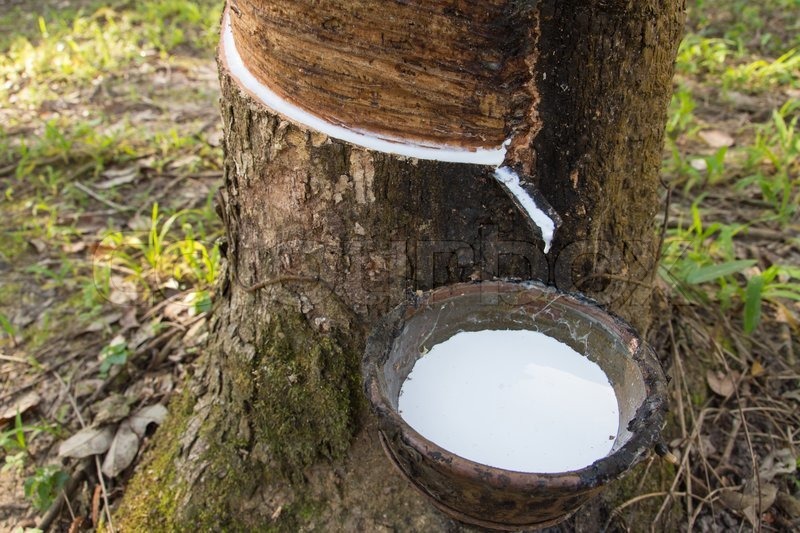 The first step in making organic latex is getting sap from rubber trees, also known as rubber milk. Palmpring rubber milk comes from Southwestern India, where our trees are grown organically, away from any pesticides or contaminants. Farmers tap the rubber trees for milk during the early morning hours over a period of 6 months, the typical length of the harvest season. Each rubber tree produces a cup of milk a day and up to 1 kilogram of rubber per season. The sap is harvested by scoring the bark on one side of the tree, and allowing the sap to drip slowly into a collection bucket. This way, the bark on the other side of the tree is allowed to regrow, and the trees stay alive and healthy throughout the entire process. Once the rubber trees reach the end of their lifespan, they are cut down to provide wood to other industries. The trees are replanted, and nothing goes to waste! It takes 800-1000 rubber trees to produce enough organic latex for a single 2-inch layer of our queen mattress. Making organic latex is a long and expensive process, so other companies use cheap chemicals and dilute their latex with other products to save money and cut corners. At Palmpring, we make sure you get the highest quality certified organic latex possible. The next step in the process is turning that rubber tree milk into solid latex you can sleep on! Some companies use synthetic latex, made with a petroleum based plasticizer like butadiene and styrene. The use of these chemicals contributes to global warming, and they can be harmful to your health! Other companies mix synthetic and organic latex in their mattresses, nullifying the positive qualities of the organic latex while adding in cheap fillers like clay particles. These fillers make your mattress stiffer and less durable! At Palmpring, our latex is 100% certified organic, without fillers or synthetic chemicals. It feels better, lasts longer, and is great for your health and the environment. There are two major methods for turning tree sap into latex: the Dunlop method and the Talalay method. The Dunlop method for making latex was first invented in 1929. Once the rubber milk has been harvested, it is whipped into a froth using a centrifuge. This gives it the light and airy texture that makes your mattress so soft and comfortable. Then, the milk is poured into a mold and steam baked to harden. Once the latex has hardened, it is washed to remove excess material and heat dried to remove moisture. This makes the latex pure, elastic, and long-lasting. Thoroughly washing the latex also removes any extra latex proteins. This makes the material hypoallergenic thus preventing any sleep issues even if you have a latex allergy. 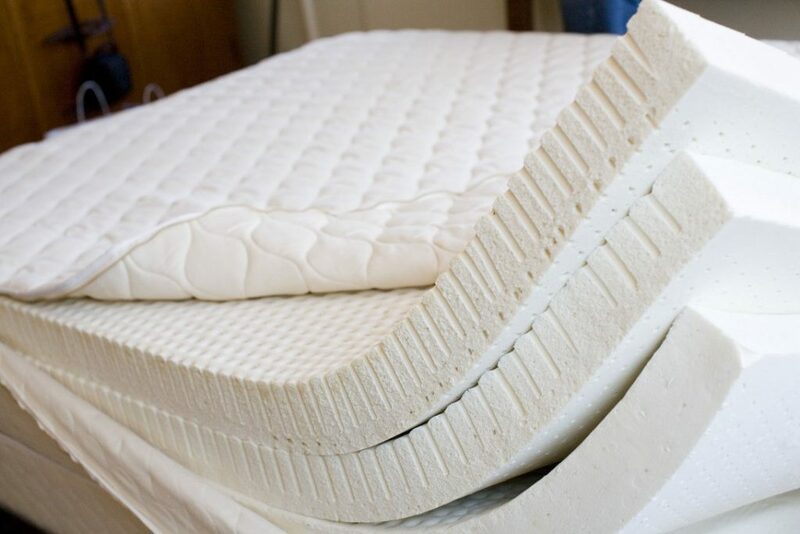 All of the latex in Palmpring organic mattresses is made using the Dunlop method. We’ve chosen this process because it creates a denser, more durable product. Mattresses that use Talalay latex don’t last as long and don’t offer as much back support. Additionally, Dunlop manufacturing is far more energy efficient than Talalay, making the process better for the environment. In the late 1940s, another method of creating latex was developed. In the Talalay method, the latex mold is only filled halfway, then vacuum sealed and chemically flash frozen. Once this first layer has hardened, they fill the mold completely and freeze again to complete the process. This creates a lighter latex that provides less support and uses more energy to make. Most mattress experts only recommend Talalay to be used as a top cushion, not for an entire mattress. You can actually tell these two kinds of latex apart just from looking at a cross-section of a mattress. Talalay latex has two sets of injection holes, starting from each side of the layer, while Dunlop latex only has one set of holes. Next week we’ll be learning about Organic Latex’s partner, coconut coir, which provides Palmpring mattresses with support and spring!